Trucker and the Fox, which is the only Iranian film at this year’s Hot Docs film festival, follows the struggle of Mahmood Kiyani Falavarjani, a truck driver who wants to make a film about the anthropomorphic love story between two donkeys separated by a fox and a crow. 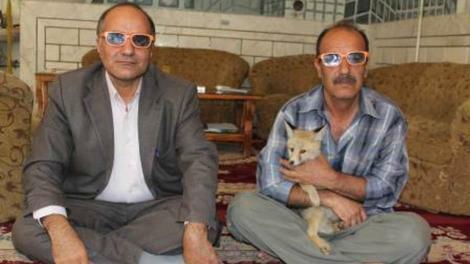 Kiyani, who has just recently finished a spell at a hospital where he’d been under treatment for his bipolar disorder, has not yet overcome the death of his pet fox. His obsession with animals – many of whom he keeps in his backyard – has led him to film several award-winning short documentaries that follow mundane moments in the interactions of different species with each other. His family, however, has had enough of his antics. He’s making less and less money from his daytime job as a trucker because of his erratic work ethic and his doctor pleads with him to forget the death of his beloved animal and move on with life. Describing the film as such makes it sound much more interesting that it actually is, because Trucker and the Fox makes no attempt to explore any of its central issues beneath the surface, so much so that by the end, following Kiyani on a hunt to find animals becomes almost exactly like one of his own observational short films. Unlike animals whose seemingly meaningless interactions can be contextualized by narration, however, Kiyani’s human motives and his past experiences with mental illness make it incredibly difficult to explain any of his actions. This could have been a fascinating study of the lengths this amateur filmmaker is willing to go to create art despite financial and personal hardships but the film opens with a conversation wherein Kiyani explains his bipolar disorder and the doctor warns him about his infatuation with animals. The audience is therefore never given the chance to speculate over Kiyani’s intentions. There is always a niggling suspicion that something is seriously wrong with the man whose life we entertain ourselves with. What weakens the film even further is that it makes no attempt to conceal the staged feeling that many of its sequences suffer from. Combined with Kiyani’s love for filmmaking, the wooden line readings confirm that many of the film’s supposedly spontaneous conversations have been premeditated. By the end, when Kiyani’s love of his animals has lost much of its positive implication and has started to appear curious at best, the film loses all its coherence and direction. Trucker and the Fox doesn’t speak about anything beyond this one man’s (staged) story; in and of itself, that wouldn’t necessarily be a problem but for the fact that the film’s admission to Kiyani’s illness upfront deprives the audience of the ability to sit through this film without wondering why the director doesn’t put the damn camera down and help his subject instead.